She trained at Birmingham School of Jewellery and Silversmithing, gaining a Credit in City and Guilds in advanced diamond mounting. This course was highly technical, and although she knew she would probable never work with diamonds exclusively, she now uses the techniques in a highly creative way. After finishing college, she worked part time in the jewellery trade to help finance her career as a designer / maker. During this period she exhibited in numerous galleries throughout the British Isles. She moved to Totnes in 1975 where she opened a jewellery craft shop . It became well know for its unusual handmade jewellery. She closed the shop in 1986. Much of the inspiration that generates her current work, comes from a rich variety of sources.She is particularly interested in cultures which tend to use a lot of patterns and decoration, both literal or abstract, ancient or modern. 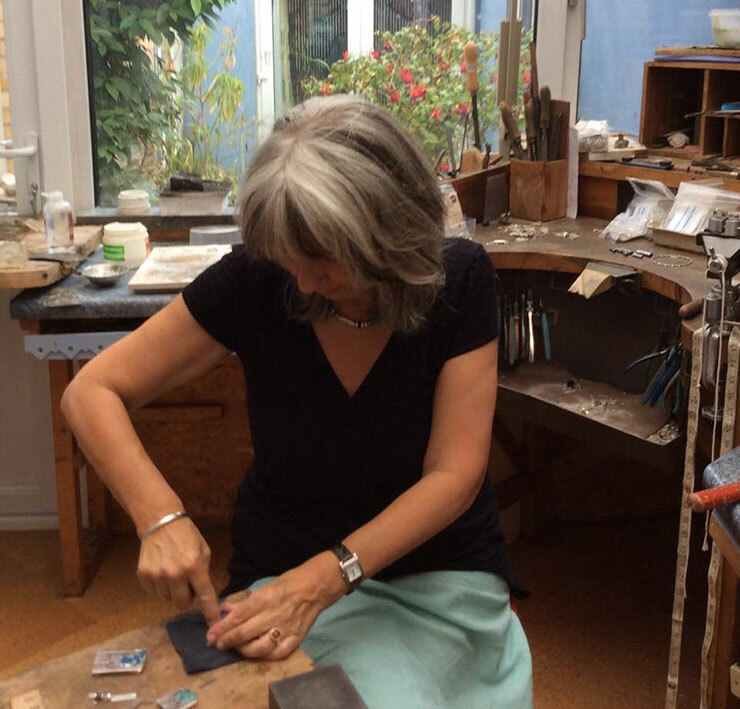 As a result of this mix, she endeavours to introduce all these influences into her current work, which includes myriads of repeating patterns etched into silver. She exhibits widely throughout the U.K.